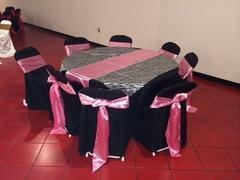 This is a black polyester chair cover that fits on banquet and folding chairs. 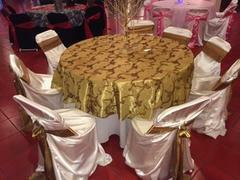 This is a universal ivory satin chair cover that fits on banquet and folding chairs. 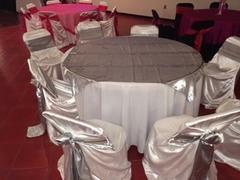 This is a universal silver satin chair cover that fits on banquet and folding chairs. 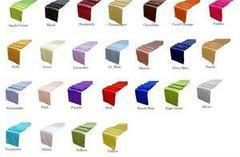 This is a universal white satin chair cover that fits on banquet and folding chairs. This is a square shaped blue and black damask print overlay. Looks great for any event! All other items rented separately. This is a Fushia Lace print overlay. Looks great for any event! All other items rented separately. This is a Gold satin overlay with a beautiful embroidered design. Looks great for any event! All other items rented separately. This is a square shaped Pink and black damask print overlay. Looks great for any event! All other items rented separately. This is a Purple Satin overlay with an embroidered design. Looks great for any event! All other items rented separately. 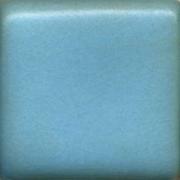 This is a square shaped Silver Satin overlay. Looks great for any event! All other items rented separately. This is a satin silver overlay with a beautiful embroidered design. Can be used with most tables. Looks great for any event! All other items rented separately. This is a Black and White Damask print overlay. Looks great for any event! All other items rented separately. This is a white organza overlay with an embroidered design. Looks great for any event! All other items rented separately. This is a square shaped Satin Zebra print overlay. Looks great for any event! All other items rented separately. 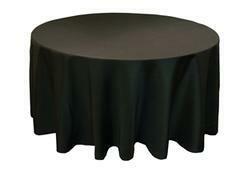 This is a beautiful black satin overlay that covers a table in a very elegant fashion. This is a Satin Cheetah print runner. Looks great for any event! All other items rented separately. 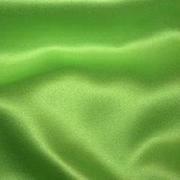 This is a apple green satin sash that can be used for an chair cover. 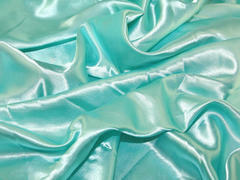 This is a aqua green satin sash that can be used for an chair cover. 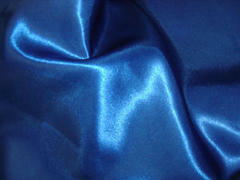 This is a baby blue satin sash that can be used for an chair cover. 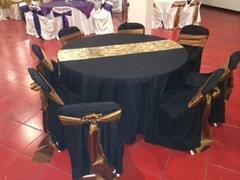 This is a black satin sash that can be used for an chair cover. 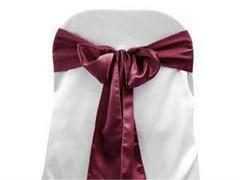 This is a burgundy satin sash that can be used for an chair cover. 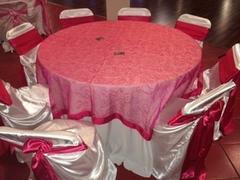 Chair cover rented separately. 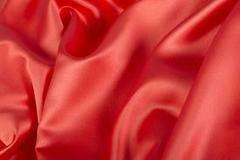 This is a coral satin sash that can be used for an chair cover. 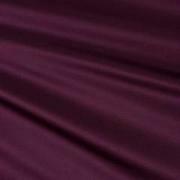 This is a dark plum satin sash that can be used for an chair cover. 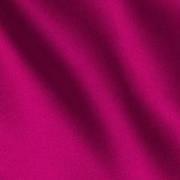 This is a fuschia satin sash that can be used for an chair cover. 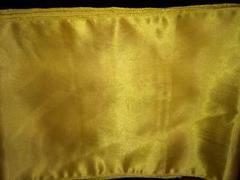 This is a gold satin sash that can be used for an chair cover. 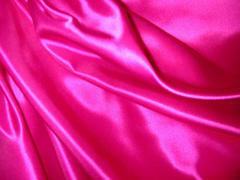 This is a hot pink satin sash that can be used for an chair cover. 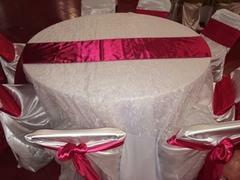 This is a light pink satin sash that can be used for an chair cover. 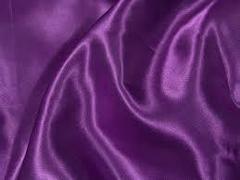 This is a lilac satin sash that can be used for an chair cover. 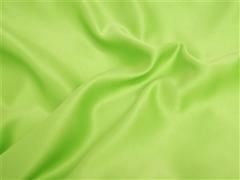 This is a Lime green satin sash that can be used for an chair cover. 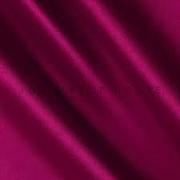 This is a magenta satin sash that can be used for an chair cover. This is only the sash. 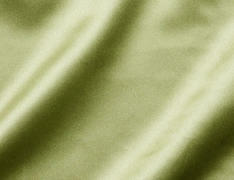 This is a mint green satin sash that can be used for an chair cover. 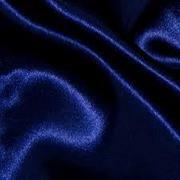 This is a navy blue satin sash that can be used for an chair cover. 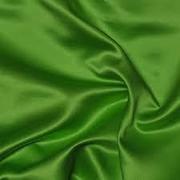 This is a olive satin sash that can be used for an chair cover. 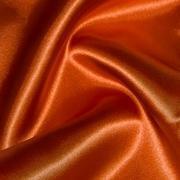 This is a orange satin sash that can be used for an chair cover. 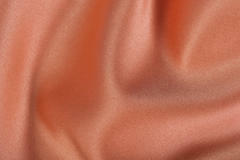 This is a peach satin sash that can be used for an chair cover. 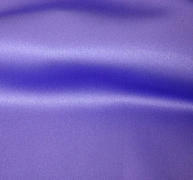 This is a periwinkle satin sash that can be used for an chair cover. 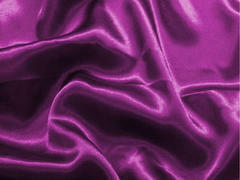 This is a plum satin sash that can be used for an chair cover. 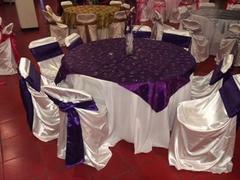 This is a purple satin sash that can be used for an chair cover. 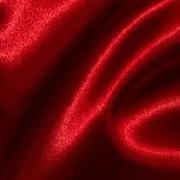 This is a red satin sash that can be used for an chair cover. Chair cover not included. 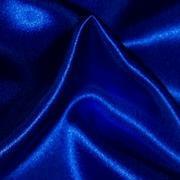 This is a royal blue satin sash that can be used for an chair cover. 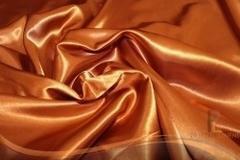 This is a rust satin sash that can be used for an chair cover. 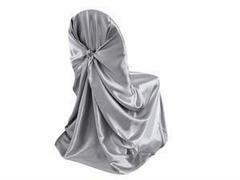 This is a silver satin sash that can be used for an chair cover. 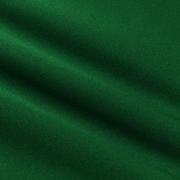 This is a teal satin sash that can be used for an chair cover. 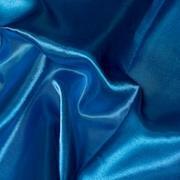 This is a turquoise satin sash that can be used for an chair cover. 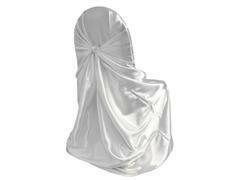 This is a white satin sash that can be used for an chair cover. 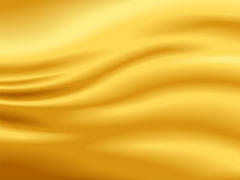 This is a yellow satin sash that can be used for an chair cover. 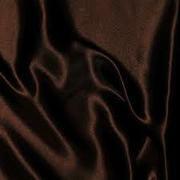 This is a 120 inch black round linen made of polyester. This linen fits a 60 inch round table to approximately floor length. This is a 120 inch ivory round linen made of polyester. This linen fits a 60 inch round table to approximately floor length. This is a 120 inch silver round linen made of satin. This linen fits a 60 inch round table to approximately floor length. 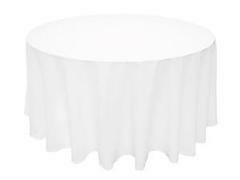 This is a 120 inch white round linen made of polyester. 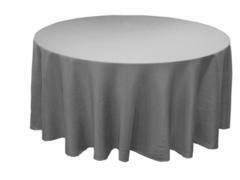 This linen fits a 60 inch round table to approximately floor length. This black spandex cover fits on a cocktail tall boy that measures 36 inches round. 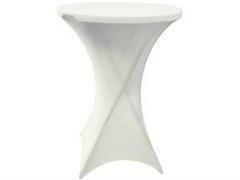 See our cocktail table that fits under 'Event Rentals items and more'. This price is only for the spandex cover. This white spandex cover fits on a cocktail tall boy that measures 36 inches round. 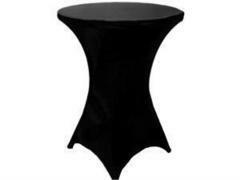 See our cocktail table that fits under 'Event Rentals items and more'. This price is only for the spandex cover.